Wake up to New Mexico Sunshine! At Adobe Garden, you are steeped in the richness of colonial Spanish architecture and the private, semi-rural village of Los Ranchos de Albuquerque. 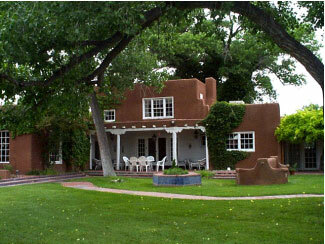 Savor afternoon tea in the shade of the grand old cottonwoods or the vine covered portal of an adobe-walled courtyard. Take a swim in our secluded outdoor pool, or stroll the historic Guadalupe trail. In the evening, warm your toes by the fire and luxuriate in rooms graciously appointed with furnishings from around the world. Wake up to the warmth of New Mexico sunshine and a sumptuous breakfast prepared to perfection. More photographs of the property. 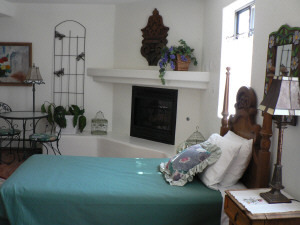 Let Adobe Garden B&B be your home away from home. We are only 15 minutes from Old Town Albuquerque, the Convention Center downtown, and the world famous Tramway to the top of the Sandia Mountains. 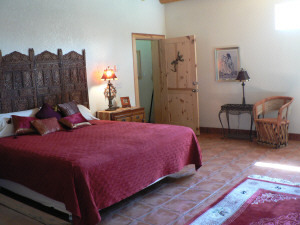 Also, just 1 block from Casa Rondena Winery and 1 ½ miles from the Rio Grande Nature Center. Adobe Garden B & B owner, Tricia Smith, was featured as “Guest Chef” at the Los Ranchos village-wide festival – Lavender in the Valley. 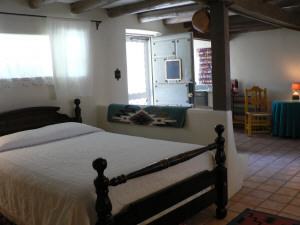 As one of an elite number of Bed and Breakfasts in the Village of Los Ranchos de Albuquerque, Adobe Garden is an active participant in village life, and a marvelous retreat for village residents and their out-of-town families and guest.